Offered this Independence Day, Monday, July 4, 2016 from 11 am – 9 pm.The patriotic package is priced at just $35.00. With The July Four, you can focus less on fare and more on the rocket’s red glare. Bobby Q owner, Bob Sikora is a true BBQ aficionado, spending more than 10 years researching cooking techniques from masters across the country. At Bobby Q the secret behind fingerlickin’ barbeque and great steaks lies in slow cooking the meat, rubbed with the perfect blend of spices, over an almond and mesquite wood-fired grill by barbeque expert, Executive Chef Mark Hittle. 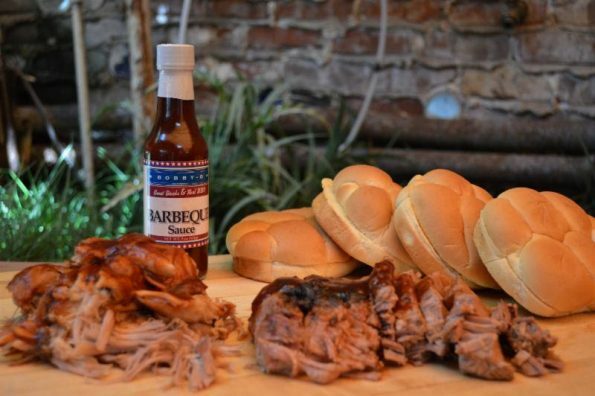 This barbeque trifecta results in succulent Pulled Pork, Smoky Sausage Links, sliced to order Beef Brisket, and three varieties of ribs (St. Louis, Texas, and Baby Back) that fall right off the bone. In addition to barbeque classic, Bobby Q also offers juicy Rotisserie Chicken as well as Salmon, Fresh Ground Burgers, and Hand-Cut Aged Steaks. Nestled in a charmingly-rustic setting, Bobby Q’s building features reclaimed woodwork with exposed brick walls, antique gas lamps, and 10-foot vintage French doors.